The CAPP (Children Are Priceless Passengers) program is a partnership between Coconino County Health Department and the Governor’s Office of Highway Safety addressing issues of education, enforcement, and public awareness of the Arizona child safety seat and seat belt use laws. 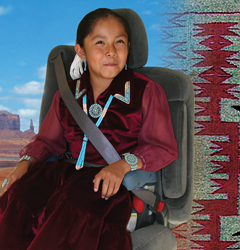 CAPP classes address Navajo Nation and Arizona child car seat and seat belt laws through education, enforcement, and public awareness. Please bring your child's car seat, traffic citation, and driver's license to class. Children not allowed in class. The classes are taught by NHTSA certified Child Passenger Safety Technicians. Most classes are held on the Fourth Saturday of the month (except for December 2012, it will be the Third Saturday). English- 9:00 a.m. to 11:00 a.m. Most classes are held on the Second Saturday of the month. PLEASE CALL 928-679-7261 OR 679-7262 TO RESERVE A PLACE IN CLASS. English classes are held 8-10am. NO LATE PARTICIPANTS ACCEPTED! All classes are held at the Coconino County Department of Health Services located at 2625 N. King Street. PLEASE CALL 928-608-6108 ext 7306 TO RESERVE A PLACE IN CLASS. Classes begin at 10:00 am NO LATE PARTICIPANTS ACCEPTED!